Your computer-weary eyes don't deceive you. Google's next experimental project is indeed a shrunken wearable for the eye, but it's one that has a more immediate purpose than Google Glass. The idea behind the Google X smart contact lens is to help people living with diabetes measure their glucose levels through the collection of tears. "Many people I've talked to say managing their diabetes is like having a part-time job," wrote project Co-Founders Brian Otis and Babak Parviz in an official blog post. "At Google[x], we wondered if miniaturized electronics - think: chips and sensors so small they look like bits of glitter, and an antenna thinner than a human hair - might be a way to crack the mystery of tear glucose and measure it with greater accuracy." 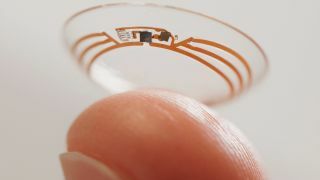 Google is currently testing a smart contact lens prototype that is able to measure glucose levels through a tiny wireless chip and miniaturized glucose sensor. These two components are embedded between two layers of soft contact lens material that, even in their current experimental state, can generate a reading once per second. This round-the-clock monitoring could be coupled with LED warning lights in the future. The miniaturized lights would warn the lens wearer that their blood sugar levels have crossed a certain threshold, alerting them to take action. The Google smart contact lens has a more acute goal compared to the company's Glass initiative, but that doesn't mean the search engine giant has ironed out an official timeline. "It's still early days for this technology, but we've completed multiple clinical research studies which are helping to refine our prototype," noted the project co-founders. They noted they are in talks with the US Food and Drug Administration, and that there's more work to be done to "turn this technology into a system that people can use." The good news is that Google is already looking to partner with experts like app developers to ensure measurements are seen by both patients and their doctors. "We've always said that we'd seek out projects that seem a bit speculative or strange," Otis and Parviz wrote. "At a time when the International Diabetes Federation is declaring that the world is 'losing the battle' against diabetes, we thought this project was worth a shot." Collecting tears instead of collecting search engine data is an altruistic moonshot that should sit well with far more people, Google skeptics among them.